The Civil Engineering Undergraduate Society (CEUS) is a student organization in the Department of Civil Engineering and Applied Mechanics. The purpose is to organize activities to promote a sense of community among the undergraduate students in Civil Engineering. 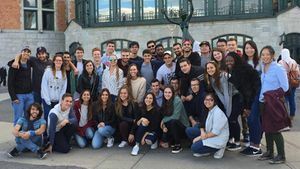 The CEUS also works closely with the Engineering Undergraduate Society of McGill. All undergraduate students automatically become members of the CEUS upon registration in the Civil Engineering program. The purpose of the C.E.U.S. shall be: (i) To represent and promote the views of its members and to implement academic, cultural, educational, athletic, professional, social, and other programs of interest to its members; (ii) To engage in other such activities and undertakings as may seem appropriate to the Society. This page was last edited on 5 February 2019, at 17:05.